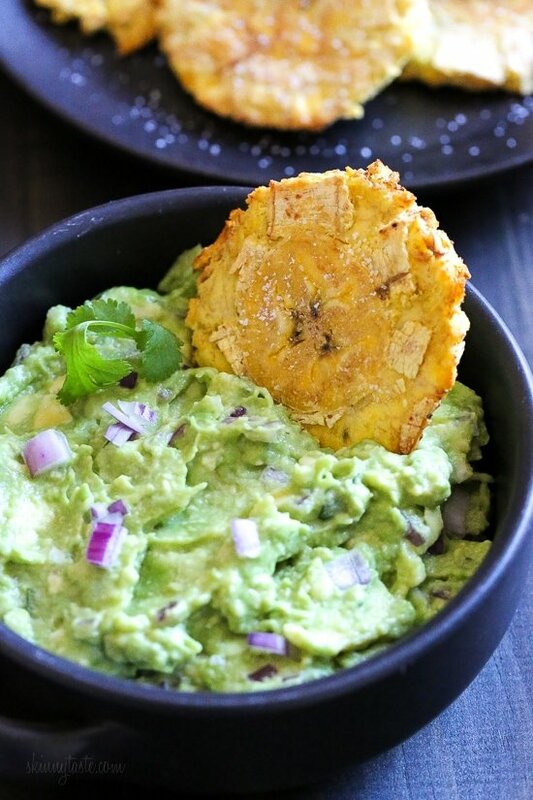 Tostones – also known as patacones or fried green plantains – are made healthier with this easy air fryer recipe. No deep frying, just a few spritzes of olive oil for a crispy, delicious appetizer or side dish. 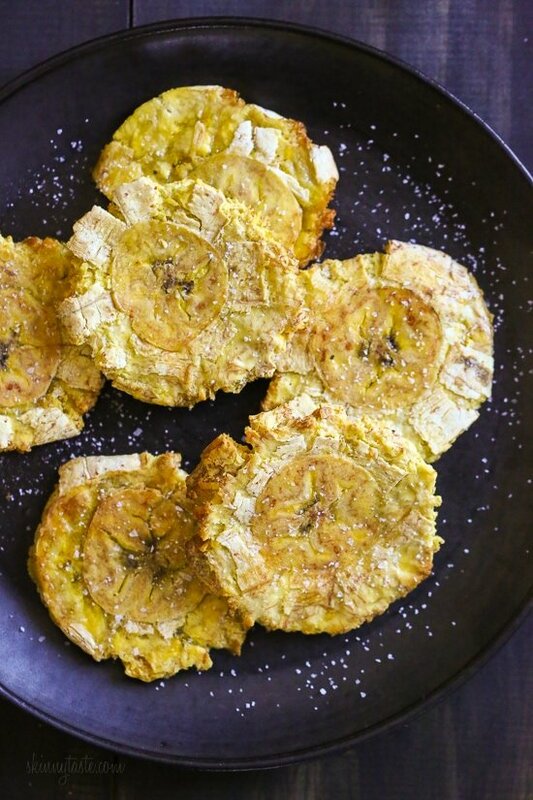 Tostones are a staple in Latin American countries and the Caribbean. With a Latin mom, I grew up eating tostones and always loved them. As a kid I would help her smash them before they went back in the oil for a second time. I still can’t resist them if we go out for Latin food, or if I find myself at my Moms house with a plate of them in front of me. Plantains, like bananas are high in potassium, fiber, vitamins and minerals. The only difference is you must cook them rather than eating them raw. These are different then maduros, which are sweet made with ripe plantains and are fried only once. These are naturally gluten-free, vegan, dairy-free, Whole30 and even Paleo friendly. Since buying my air fryer, this has been on my top to-do list of recipes to try and turned out great! Tommy was a happy man as they are one of his favorites, we served them with a bowl of guacamole which would be great as a Superbowl appetizer. I’ve made Baked Tostones in the oven, but I think they came out much better in the air fryer. I used the same technique my family uses to deep fry, only without all the oil using my air fryer. I have the Nuwave Brio Air Fryer (affil link). Start with green plantains which look like bananas, only larger. 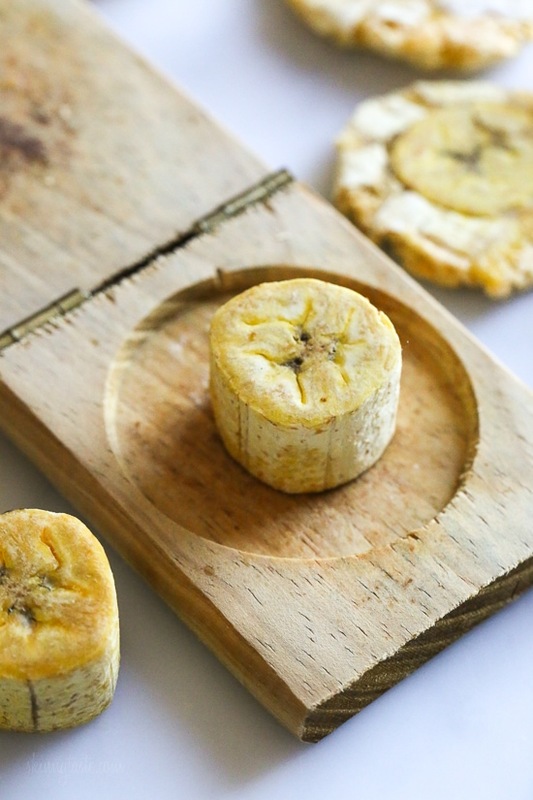 Trim the ends of, cut a slit along the length deep enough to penetrate the skin without cutting the plantain. Cut into 1-inch pieces, then peel each piece (putting a little oil on your fingers helps peel them easier). Spritz the plantain with a little oil then cook a few minutes. Remove from the air fryer and smash while still hot. Spritz both sides with the oil and place back in the air fryer until golden and crisp. A tostonera (affil link) is typically used to smash them, if you don’t have one you can use the bottom of a cup or jar to smash them. Add them to a salt water brine for a second or 2 before adding them back to the air fryer. After they cook, I like to give them another spritz of olive oil so the salt sticks to them. Eat right away. 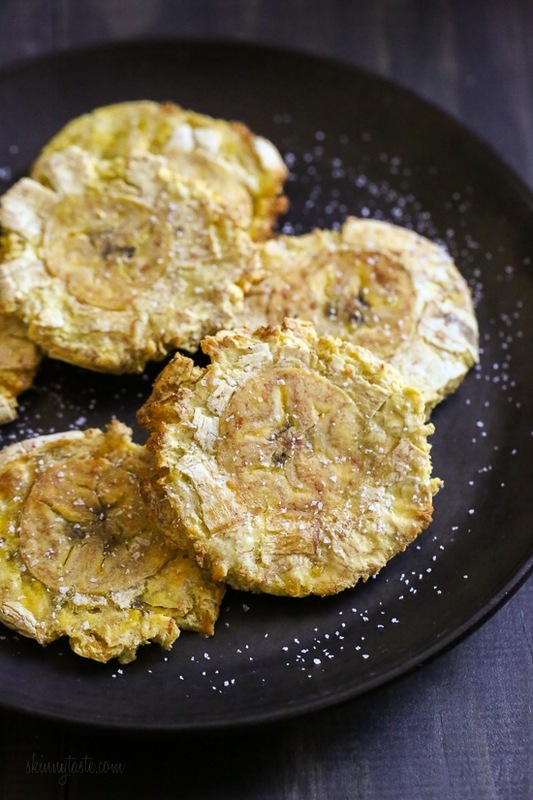 Tostones are typically salted and served just like chips. You can add a dipping sauce such as guacamole, ceviche, zesty avocado dressing, mojo or in Colombia they serve it with hogao (I will share that recipe soon). This also makes a delicious side dish for Picadillo, Pernil, or Rice and Beans. These easy tostones also known as patacones or fried green plantains are made healthier in the air fryer. No deep frying, just a few spritzes of olive oil for a crispy, delicious appetizer or side dish. 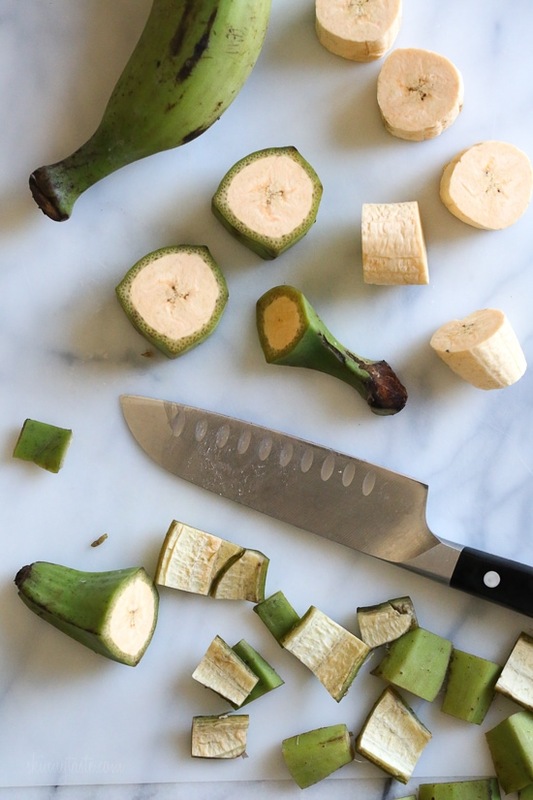 With a sharp knife cut a slit along the length of the plantain skin, this will make it easier to peel. Cut the plantain into 1 inch pieces, 8 total. In a small bowl combine the water with salt and garlic powder. When ready, spritz the plantain with olive oil and cook 6 minutes, you might have to do this in 2 batches. Remove from the air fryer and while they are hot mash them with a tostonera or the bottom of a jar or measuring cup to flatten. Dip them in the seasoned water and set aside. Preheat the air fryer to 400F once again and cook, in batches 5 minutes on each side, spraying both sides of the plantains with olive oil. When done, give them another spritz of oil and season with salt. Eat right away. They have frozen Hawaiian plantains where I live. Big and delish. I followed the recipe and they were delicious! These were great. 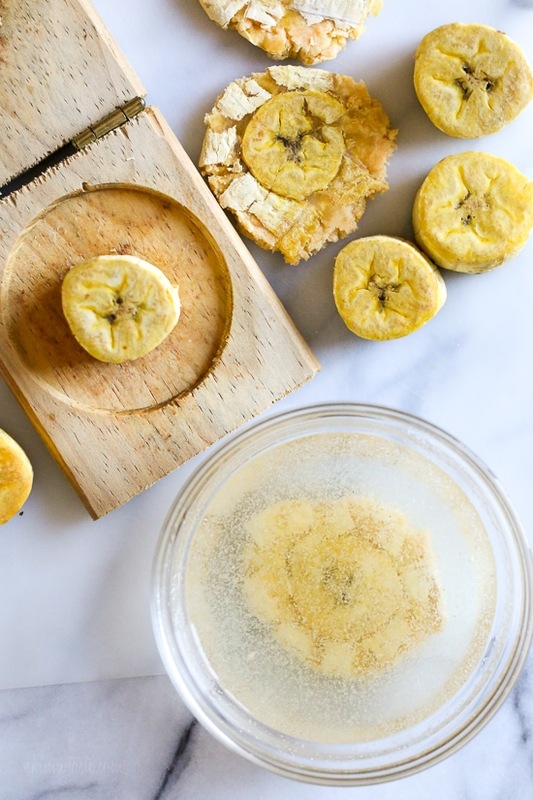 I love air frying and wanted to make a lower calorie healthier version of tostones. They were delicious! 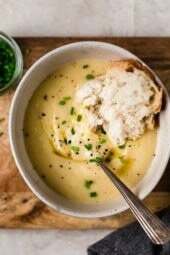 Made a garlicky yogurt sauce to dip them in. These were amazing and I followed the recipe exactly as shown. 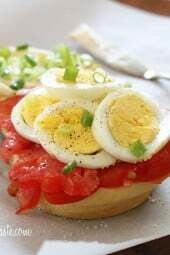 I served them with Heinz’s mayochup and I LOVED it! Thanks, Gina!! I was excited to try this recipe using my new air fryer, but unfortunately they did not come out good. The time it took to reheat the oven and cooked it once and then twice again again was not worth the effort. I rather stick to frying themin my skillet. They come out delicious every time! My Cuisinart air fryer heats up in no time and cooks fast! I’m confused as to how these are 5 points. The plantains are zero. Unless you are spraying a lot of oil on them, I would think they’d be 1 point max. You could use Pam or other 0 calorie spray and follow the rule of a 2-3 second spray on each side. But 5 points? That’s a lot of oil. I love these and can’t stop making them – amazing Whole 30 staple. One question I have, can you reheat them the next day? Would they be any good if reheated in the toaster oven? TY! They are always best fresh but re-toasting them couldn’t hurt. Let me know how they come out. How many days can they be stored? Thank you! LOVE this! 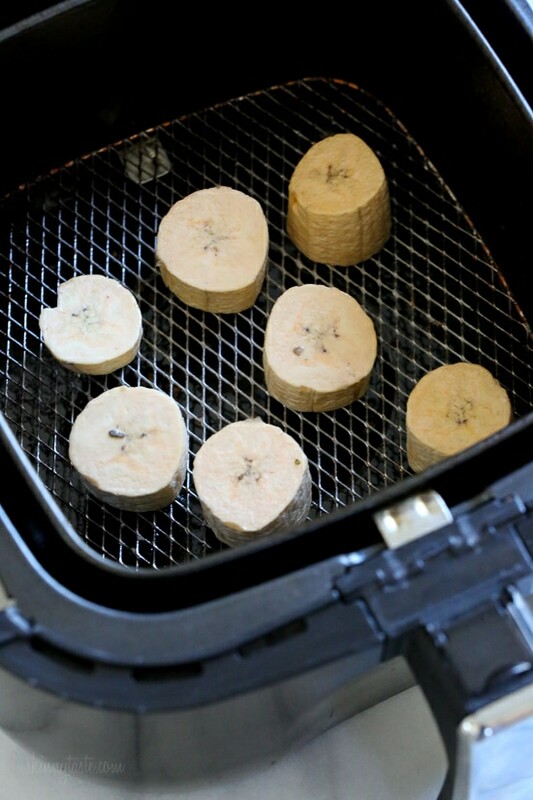 Have you ever tried to put in FrozenTostones in your Air Fryer? I came across this recipe while trying to fun instructions how long I should put frozen tostones (and previously smashed) in there. Made these tonight for a pre-dinner snack and they were delicious! I had tostones while on a medical mission trip in Honduras and fell in love with them but I never fry at home so I have never made them until now. Thanks for the recipe! I made these this weekend exactly as directed and unfortunately they were awful. They were dry and crumbly. I understand trying to save calories but these were terrible. I make plantains frequently and was embarrassed to even feed them to others. Sorry. 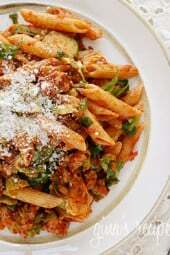 I make a of other recipes from this website with awesome results but this one is the exception. Thanks Gina! Those air fryers seem incredibly convenient and fantastic! I read your post and immediately had to forward this on to my mom. Thanks fors sharing this recipe! I forgot to soak in brine ans my we’re so dry and kinda flavorless. I love these fried. I’ll have to try again. How do you make a bribe?? Hello. 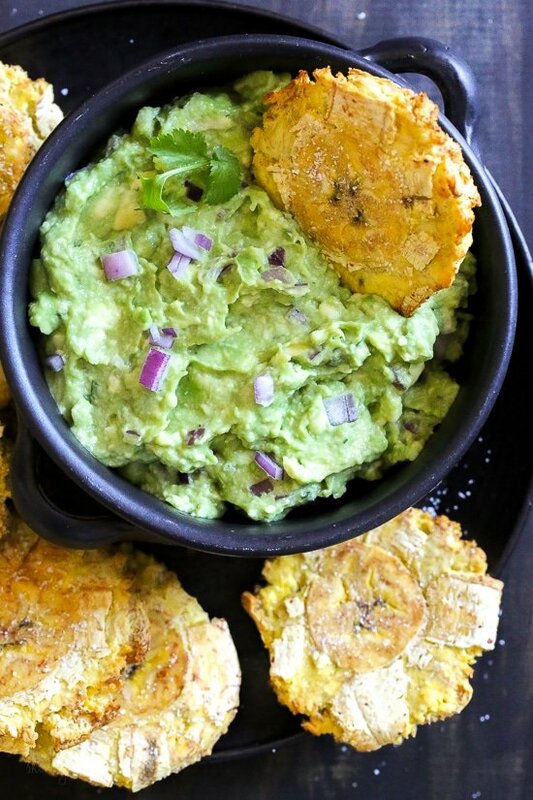 Tostones are one of my favorite sides! Love them. I am doing Smart Points but not the Freestyle. How many Smart Points (non free style) are these? Also, how can I figure out how many regular Smart Points other food is if it only states the Freestyle poits? Should be the same. I wont have that info as I use WW recipe builder to get all my points. I grew up with these as well, having been born and raised in Panama. However, as much as I cook, I’ve never made them (gasp)…I’ve always been intimidated by trying to get those stubborn peels off. Your great tips have inspired me to give them a go. Perhaps I won’t have to depend on the frozen ones from Goya anymore (although they are pretty good)! Hope your family is drawing together, and finding some peace after the loss of your Pappito. yes its easier to cut them in small pieces first. Try with 1, thank you! I am in the market for an air dryer and I like the one you have linked…curious what size you use? Thanks for the great recipe – will try for sure! There’s not much difference in 3 qt to the largest size. Hi! I don’t have an air fryer and don’t want to fry these in all the oil. Can I put them in the oven? 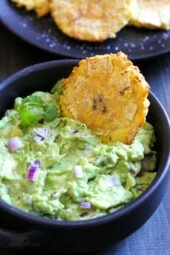 She included a link to her recipe for Baked Tostones in the middle of this post, before the air fryer recipe. Hi Gina, Raw plantains are zero points so I was wondering, if you’re only spritzing them with oil, how you came up with 5 points per serving. Thanks! They look great! They have points when I looked in recipe builder. I wish they were 0! Tostones are my most favorite thing in the whole wide world! Thank you for this recipe!!! Being Puerto Rican we ate these a lot growing up. I have made these before in our airfryer as well and they turn out great! You go to Puerto Rico and they serve them with minced garlic. The dipping sauce is mayo-ketchup. It’s funny a hot dog stand has bottled ketchup in Puerto Rico every restaurant has a bottle of mayo-ketchup on the table. Mix it and let it sit for a day or two before you cooked the tostones. The ketchup/mayo i make , i also add toasted garlic powder to it as well and i keep that in the fridge..family loves it. I’ve been so intrigued by the air fryer lately!! This sounds so good and simple! What air fry cook book would you recommend? I’ve just purchased the air fryer, so excited! Hi, Gina. I had never eaten plantains until a recently on a cruise stop in Costa Rica. We are in love with them, now. I don’t have an air fryer, but I need to get one soon!! Can’t wait to try your microwave version. You can also just bake them in your oven as well. It essentially does the same thing as an air fryer, the only difference is the air fryer will make them just a tad crispier than a convection oven. Having said that, I just got an air fryer today, so I’m definitely going to try it out with plantains just to see the difference since I’ve been making them in the oven for over a year now. Why do you soak it in the brine before putting it back in the air fryer the second time?